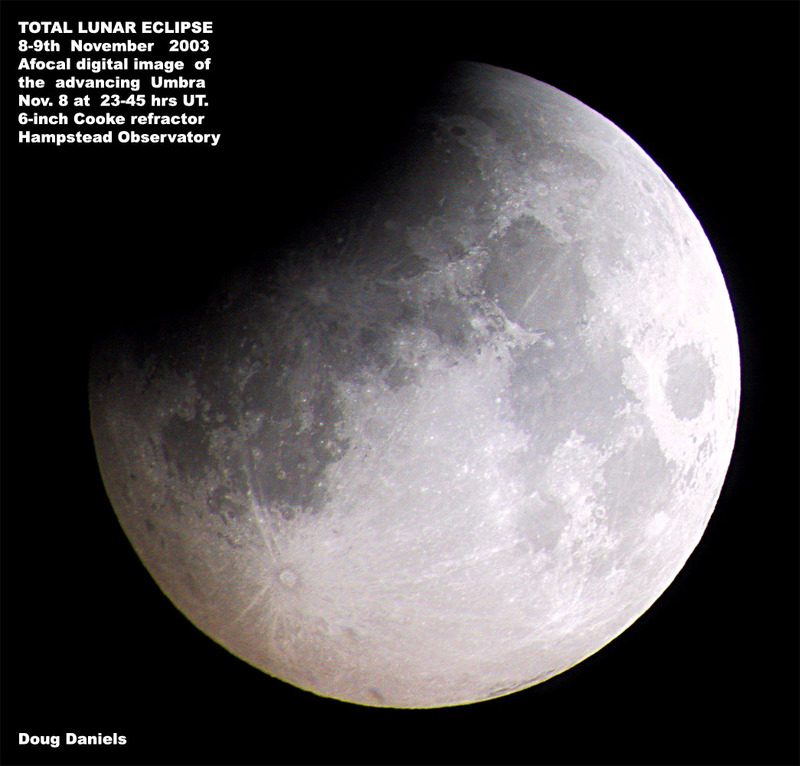 Once again poor weather spoilt our observations of the total lunar eclipse of November 8-9. The 'regular' observatory opening was cancelled due to total cloud cover, however by 22.30 hrs., the sky began to clear so we had high hopes and opened the observatory. Gary Marriot, Leo McLaughlan, Simon Lang and myself, together with about half a dozen keen members of the public witnessed the early stages of the eclipse. The moon was already in the penumbra when we arrived at the observatory, a slight darkening was observed on the preceding limb of the moon. First contact of the umbra occurred at 23.32:30 UT. I managed to take a digital image of the advancing umbra at 23.35 hrs. simply by hand holding the digital camera to the eyepiece of the Cooke. This was to be the only decent image which I managed to get as cloud slowly rolled in to mask the event. By the time of totality at 01.06:16 UT on the 9th, cloud cover was also total. We just managed a few short tantalising glimpses of the total phase through gaps in the cloud - enough to see that it was a fairly dark eclipse. The moon took on a deep ruddy hue, remaining quite bright at the southern limb. By the end of totality at 01.30:48 UT, cloud cover was complete and dense so we ended the session.